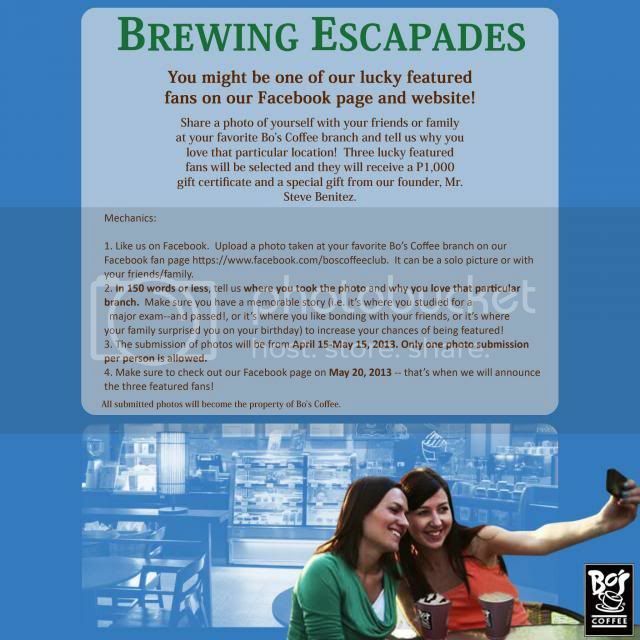 Last May 10, 2013, I joined a contest from Bo's Coffee Club's Facebook site. "26 Aug 2009 was the first time i went to Cagayan de Oro to meet my GF's family. the next day was our first ever formal date, after which, we strolled in LKK. 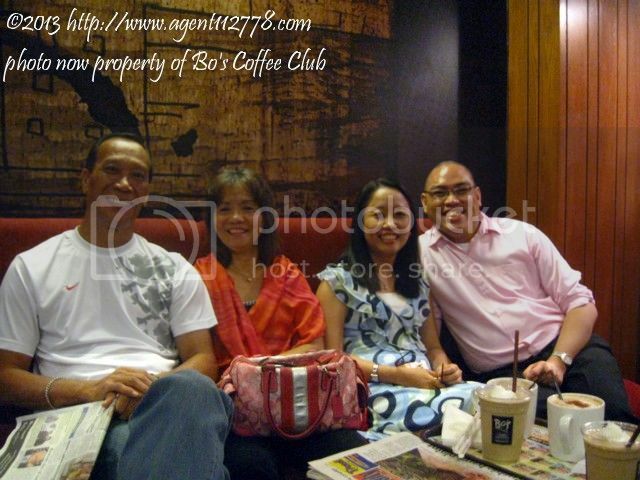 after a few minutes, her father texted her and he want us to meet them in Bo's Coffee in Rosario Strip. It was my first time to go to a coffee shop. From then on, every time i visit CDO (w/c is 2x a year)I always go to that same place to reminisce my life's many first. 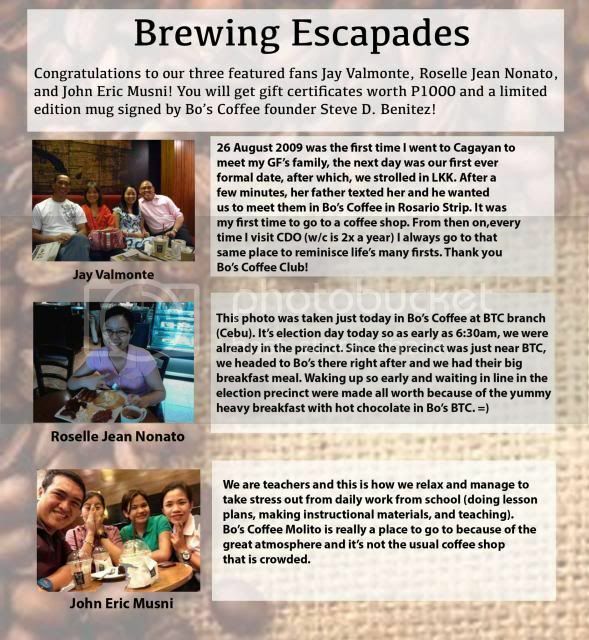 Thank You Bo's Coffee Club for being my accomplice"
But here's the Complete Sharing/Story. 26 Aug 2009 was my first time to go to Cagayan de Oro. It was my first time to Meet her family and also my first to go to Mindanao. The next day, we post celebrated our first year anniversary as BF/GF, it was our first formal date. After dinner, we strolled at the Lim Ket Kai Mall (LKK) after a few minutes, her father texted her inviting us for coffee at the Bo's Coffee Club's Rosario Strip. I was shy and puzzled upon entering the coffee shop. It was my first time to go to such place. Flashbacks of movie scenes where customer recite their orders in a fast fluid manner. Unlike me, who is clueless of what to say. "I think its better for you to order" I said to GF. "Just order what you want" she answered. So I just read whats on the board: the coffee I always dreamed of having - Cappuccino. The clerk asked a few questions and I got the hot big mug. As for GF, she had a hot choco, as for her parents and her sister those frappes which I can't recall. Her sister took this photo for us. After this meet-the-parents' date, we all headed home. The next day, and the next day thereafter after bringing her to work or before getting her after work, I still go to that place to reminisce my life's many first. 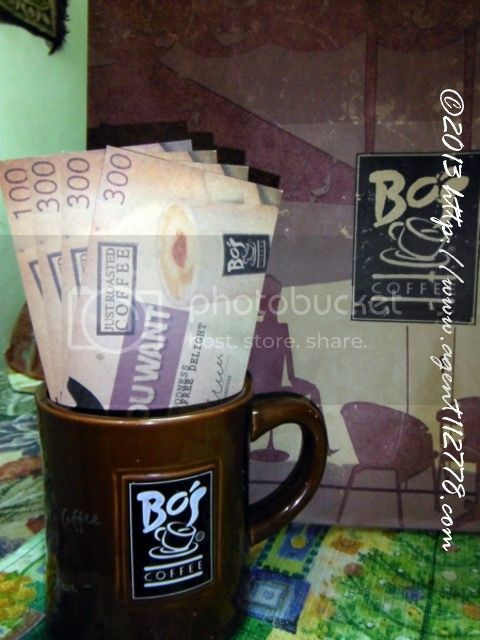 June 4, I went to Bo's Coffee Club's SM Megamall Branch to pick-up my prizes. Thank you Bo's Coffee Club for choosing my entry. After 4+ years I finally have an Bo's Coffee Club Mug. I dreamed of having it but I dont want to buy it. I wanted it as a gift or like this winning it. Sadly the autograph of Mr. Steve Benitez washed out from the dishwashing :( but stil I have a mug! YES! as for the GC, I promised we'll use it as a double date: me & GF and her parents to thank them for inviting us on that first coffee date. If that coffee date did not happened, i'll never have this sharing and this prizes. Daghan salama pud GF's parents!